Songs and chants by the bad-boy poet laureate of Breaking Bad and Dead Poets Society … Whitman’s optimistic, (r)evolutionary message for 21st century ears, hearts, and minds. Below read reviews from Grammy Award winners and nominees! Then click icon left to purchase. To read more about John’s show, watch video clips, and read the testimonials, click I Sing Walt Whitman! above. 18 Responses to I Sing Walt Whitman! “I was exposed to the wonderful poetry of the great Walt Whitman in the early 70s and found it very compelling. 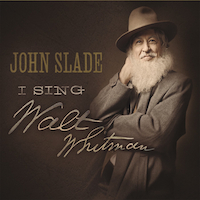 But when I heard John Slade’s I Sing Walt Whitman!, it came alive for me as never before! Truly joyful, uplifting and spiritually energizing! Walt Whitman was a New Age prophet, WAY ahead of his time; sharing profound spiritual truths with eloquence and grace, at once easily accessible and sublimely mysterious. John Slade and his wonderful musical magicians bring all of this alive in a magnificent way! John Slade has shared a uniquely creative tribute to this much loved poet, capturing his wit and wisdom with style, humor, and true artistry. I’m sure Mr. Whitman would be impressed! — Al Walser, 2013 Grammy® Nominee / CEO and Founder, Cut the Bull Entertainment, Inc.
“I Sing Walt Whitman is an amazing listen! The melodies are both catchy and diverse, but it is the words and performance that make it profound and fun to listen to. I felt somehow transported by different eras (flavors of hip hop, Motown, techno, even Springsteen!) to feel the undercurrent of Whitman’s irrepressible, non-judgmental joie de vivre, as if his unbridled love for America and freedom (and us!) have been here all along, carrying us gently through the decades like a powerful river. A Cesena (Italy) abbiamo istituito un premio biennale in onore della cantante Marietta Alboni, che il grande Walt Whitman ebbe modo di ascoltare la prima volta il 23 giugno 1852. Ricordando Marietta Alboni abbiamo istituito un premio biennale nella citta’ di Cesena (Italy) , anche occasione per ricordare il vostro grande Walt Whitman.